Head s impeccable reputation for building the best race skis on the planet transfers well to their recreational carving skis, too, and you'll feel it immediately in the way the i.Supershape Magnum rails the corduroy. With a tiny bit of rocker in the tip to make the skis less hooky and easier to initiate, and Head s World Cup Sandwich Cap construction working for you, you'll rule the groomers like never before. Speed Rocker – A slight tip rise on a ski with standard camber means great performance and perfect, versatile performance on hardpack. 10% rocker in the tip and 90% camber is just what you need to keep the skis from feeling "hooky" while retaining solid edge bite during the turn. ERA 3.0 S – Head combines rocker, radius and rebound technologies to create the perfect balance of all mountain performance. WC Sandwich Cap Construction – A wood core sandwich with Titanal combines the solid and responsive performance of the vertically laminated core with the dampness and control of Titanal. The upper layer is wrapped by a cap construction for durability. Hybrid Sidewall / Cap Construction – Sidewalls over the edges with a cap over the top layer of the ski for increased resistance to edge impacts. 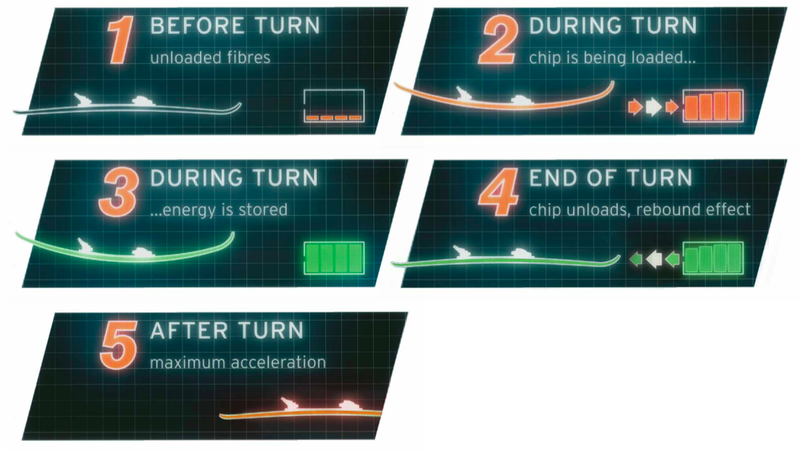 KERS (Kinetic Energy Recovery System) Technology – KERS technology works like a turbocharger by stiffening the tail of the ski at the finish of the turn - the resultant "boost" catapults the skier into the next turn. KERS is an electronic, fully automated and integrated system.